Bringing heart and soul into a forgotten part of a city context is an easily mismanaged challenge. 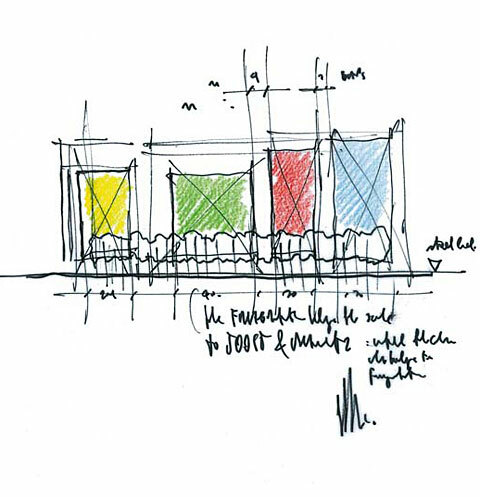 How do you create a landmark building with a strong identity which realises the full potential of the site, while making sure it respects the existing townscape and urban scale? 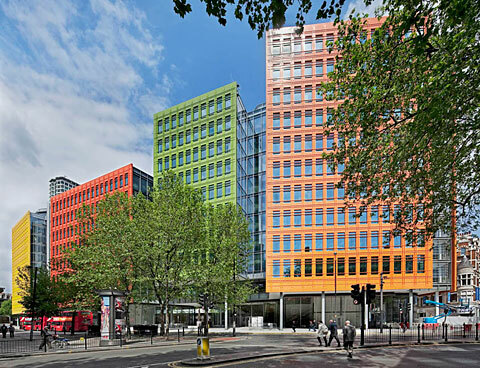 Renzo Piano's striking new 15,240 square meter Central St Giles mixed-use development in London gives new meaning to the site intersecting Covent Garden, Bloomsbury and Soho. Sited on the historic St Giles High Street, there were local community organisations and English Heritage to appease, and some awkward physical conditions. Dominated by a one way road with the sweeping glass facade of the new Molteni/Dada showroom on its south side, the street has few shops, restaurants or housing. 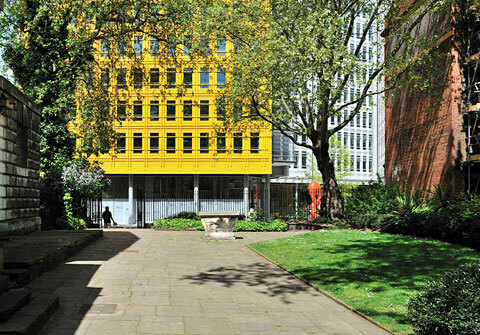 There is a church and its garden overlooked by the now listed "Centrepoint", an early 1960s office building, while flanking the site to the North West is the future Crossrail station at Tottenham Court Road. 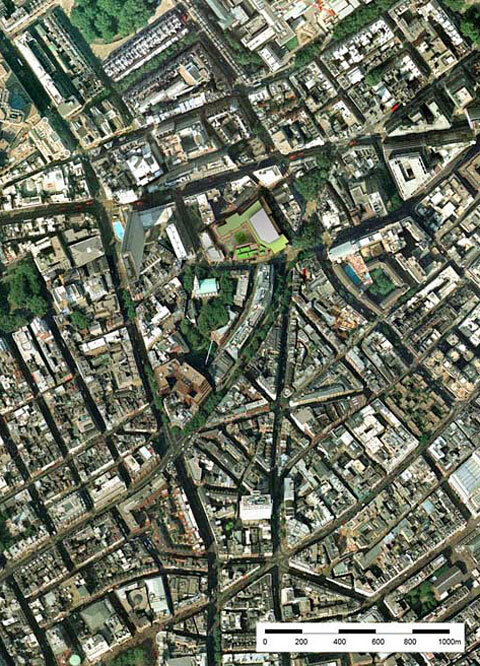 Renzo Piano proposed a master plan for the site four years ago, and so did Rogers and Foster. Piano's won. It arranges blocks of more than 120,000 square meter of office space around a public courtyard along with two of apartments, cutting five public routes around the assemblage. At ground level a fully glazed sequence of seven restaurants and two retail units sits on either side of a public access route through the site, which leads to a public courtyard "Princes Circus" into which light pours. The scheme brings life to St Giles High Street, where once stood a grey hulk of a building from the 1960s. There are echoes of existing patterns, for example the main access route corresponds to the passage through the church garden to the south across the road. 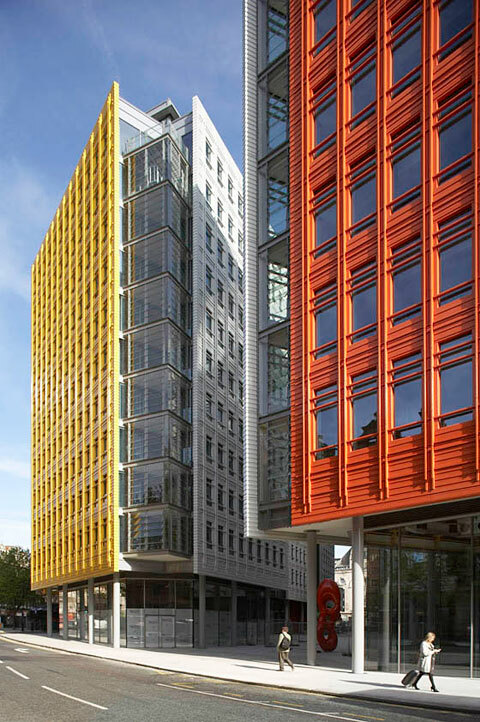 Eye-catching cross the cityscape are the scheme's vibrant glazed ceramic tiled facades, "levitating", as Piano puts it, above the ground units. None of the facades match up. Outside, they are set at slightly different angles, vary in colour and size, but are all parallel to the medieval street pattern. 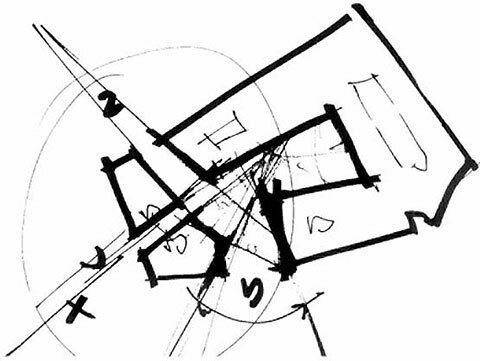 They each attract the light in a different way, giving the building dynamism. Narrow recessed facades of each one are fully glazed from floor to ceiling with crenellated mullions, a feature Piano is also using in the skyscraper "Shard of Glass" at London Bridge to keep the structure light. At ground level, the sheer scale and permeability of the apertures between buildings and height of the glazed units gives visitors a dramatic experience. From the courtyard, in between the buildings, decked out with furniture, trees and some sculpture, you can see glimpses of surrounding streets. A glazed lobby runs northwards off the open entrance on the south side, with glazed fin panels, slender columns and Piano's pendant light fittings. 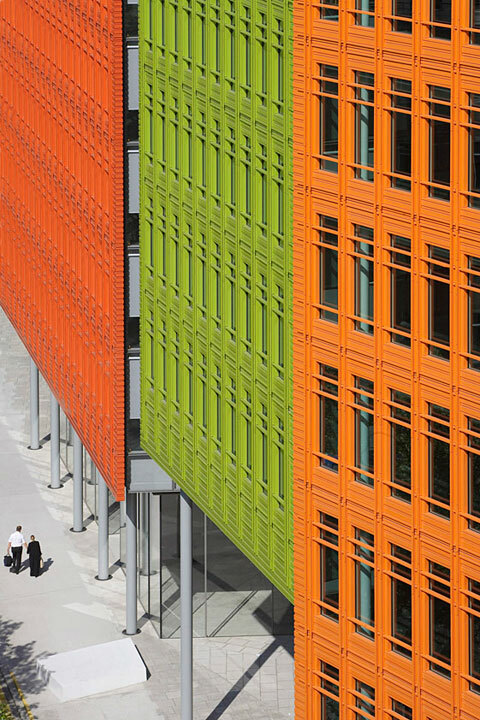 Orange walls and orange digital floor numbers also make this an unusual office building. Also, the architect's detailing - practical and elegant - is evident throughout, with a strong mix of bespoke design elements, including floor grilles, glazed ceramic tiles, hand finished polished plaster walls and his spotlights. The office floors include two grander scaled ones high up. From the west facing, roof terrace you can see a south-facing winter garden. The sustainability strategy includes a double skin façade, sedum roof, a biomass boiler and most of the materials used are recyclable. 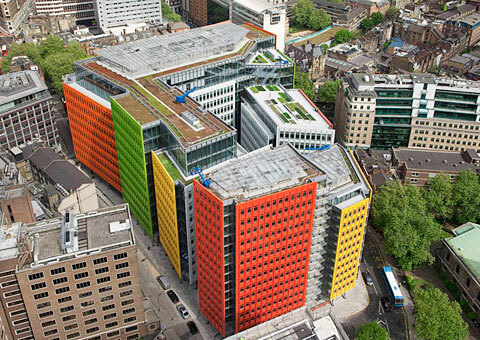 This scheme cost £170 millions. It is unlikely that this figure would be invested in a project of similar design calibre and public value in Central London now. Piano's skill in handling complex forms and details is driven by his strong desire to create an authentic public space in a grey, soulless context where it was lacking. 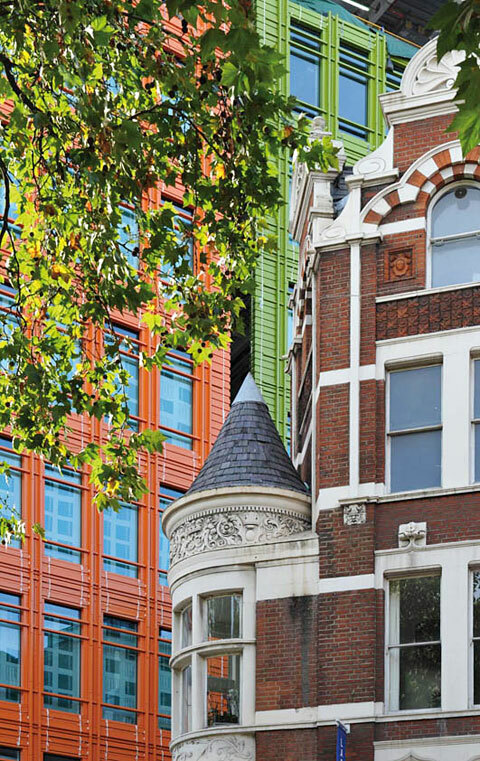 While the colours have caused some debate, the blogger who called the facades "cheeky" and "very London", got it right. Perhaps Piano has a good reading of London's soul.